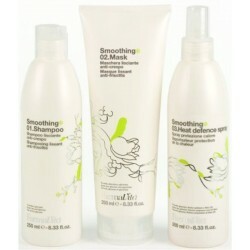 Smoothing - Just Beauty Products, Inc.
Smoothing There are 4 products. 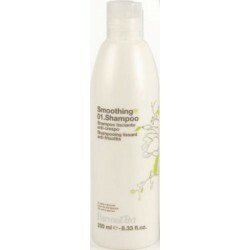 Farmavita Anti-frizz Smoothing 01 Shampoo for Dry/Unruly Hair Gently cleanses and, thanks to purifying and softening properties of green tea and glucose, nourishes and calms frizz leaving hair smooth, weightless and shiny. Farmavita Anti-frizz smoothing mask for dry/unruly hair. Thanks to purifying and softening properties of green tea, glucose and glycerin, hydrates and calms frizz leaving hair smooth, shiny and manageable. Farmavita Smoothing 03 Heat defence spray. Special thermo-polymers create a protective film that wraps around the hair to prevent hair damage during hot styling. Green tea and glucose give nourishment and shine, leaving hair healthy, shiny and weightless. With UV filter. Farmavita Anti-frizz smoothing shampoo for dry/unruly hair. Anti-frizz smoothing mask for dry/unruly hair and Heat defence spray.